Advertisement or Commercial Exploitation of a U.S. President? The White House has been busy in 2010 requesting the removal of President Obama’s image from advertisements. The NY Times and other news outlets have reported the story in detail, but many have painted the legal justification for these requests as falling in a constitutional gray area, and have suggested that the First Amendment might protect the purveyors of advertisements in question. While journalists may have given this view credence to provide balance or a hint of drama to their articles, a more specific legal analysis suggests that President Obama would likely be successful in any litigation against the companies that sponsored the ads. In early February, the website classesandcareers.com ran an Internet ad encouraging students to “Go back to school and get your share of the stimulus money.” The ad featured an image of President Obama in the foreground and people in mortarboard hats in the background. 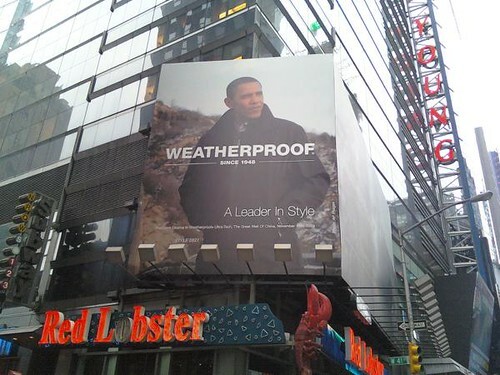 In its coverage of the Weatherproof billboard story, the NY Times interviewed Kevin M. Greenberg, an intellectual property attorney with Flaster Greenberg. Greenberg was of the opinion that the legal framework for re-use of an image of a president is somewhat unclear, falling between publicity rights and the First Amendment. “‘[I]t’s very unclear where the First Amendment ends’ and where public officials’ right to control their endorsements begins,” Greenberg said. According to Professor McCarthy, author of the comprehensive treatise on the subject, the right of publicity is “the inherent right of every human being to control the commercial use of his or her identity.” Although publicity right laws vary from state to state, generally infringement of the right of publicity occurs when the complained-of use is commercial, unauthorized, identifies the plaintiff, and is likely to harm the economic value of the plaintiff’s identity. New York, where a claim against Weatherproof could be brought, has an especially strong right of publicity statute. The right of publicity can in some instances be limited by the First Amendment’s free speech protections. Courts apply a balancing test to determine whether the First Amendment limits an individual’s right of publicity. A court will balance the content of the speech against the countervailing right of publicity interest of the plaintiff. Speech that contains a political message receives the highest level of protection while speech purely for commercial purposes receives the lowest. Mackey said that the First Amendment would do little if anything to shield these ads if the White House were to pursue a claim for the unauthorized use of Obama’s image. President Obama is not the only political figure to be used recently in advertising. PeTA featured Michelle Obama in an unauthorized ad that declared “Fur Free and Fabulous.” In Minnesota, a group of businessmen made headlines when they put up an unauthorized billboard that depicted former President George W. Bush and the phrase “Miss me yet?” Despite speculation to the contrary, one of the businessmen said the billboard was intended only to call attention to a humorous Internet meme.